Today we’re back in the dining room and I’m sharing my source list and budget breakdown from the One Room Challenge. I had planned on including all of this in my reveal post, but work was crazy last week and I didn’t have a spare moment to pull everything together. I barely got my reveal post up! Anyway, let’s start with the source list. I think I covered everything in the pictures, but if you see something you are curious about and I didn’t cover, let me know. Oh, and thank you for all of the kind comments on my reveal post! I'm so happy with how the room turned out and I'm glad you all liked it too. OK, now let’s talk money – I knew this wouldn’t be a cheap project because I had to buy all new furniture. I tried to buy everything on sale and I think I ended up getting pretty good deals on everything, so I’m happy with the total. BUT, I sold my old dining table on a Facebook yard sale group for $100, so my total is really $682. Lastly, let’s talk about the to-do list. Once I set up the table and chairs inside I realized the finishes didn’t look bad together, so I decided not to paint anything. I owe a big thank you to everyone who suggested that I put it all together and live with it before painting anything. You definitely saved me a lot of unnecessary work. In other to-do list news, I decided not to replace the ceiling fan with a light fixture. I just couldn’t do it. I know light fixtures are so much better looking, but ceiling fans are a must in Phoenix. We use that one quite a bit if we are working at that table, so I decided to keep it. That being said, everything has been crossed off my to-do list except one small project that I decided to add last minute - I want to hang a wood sign above the cup rack. I think the wall needs something else and I would love a boulangerie sign like this one or something similar. I was hoping to find one, but I think I’ll end up must making it myself. I already bought the wood, so hopefully this project will get crossed off soon and I’ll officially be done. 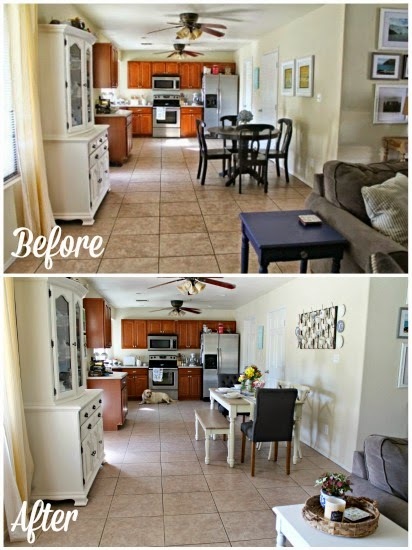 Overall I’m so happy with how my dining room turned out and I had a great time participating in the One Room Challenge. I’m already looking forward to the next one! You did a great job on the room and with the budget!